Join us on Sunday April, 30th from 2-4pm for an in-store appearance from Toronto author and urban observer, Shawn Micallef. We’ll be celebrating the launch of his new book, Frontier City and also discussing The Trouble With Brunch and Stroll. After the talk, we’ll head out for a small walk around James St. North. This is sure to be an engaging conversation. We’ve wanted to being Shawn into town for a while now. Really honoured to present this to Hamilton. Event is free to attend and Shawn’s books will be available for purchase. 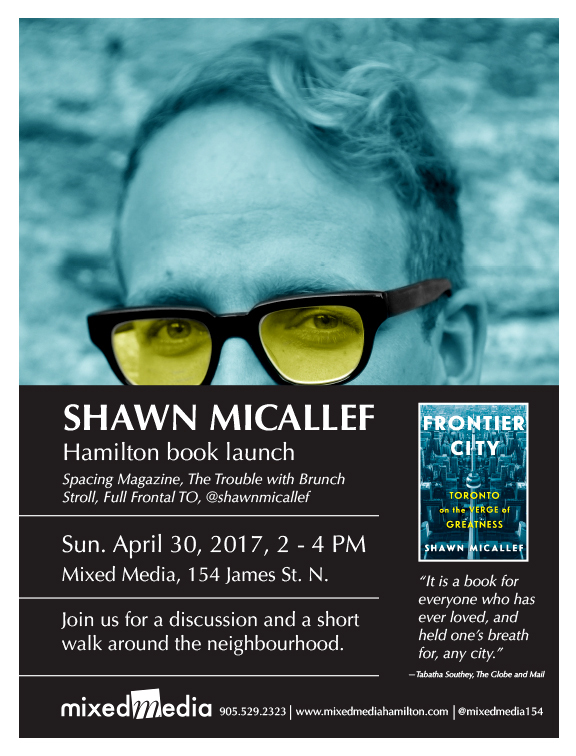 This entry was posted in books, news and tagged book launch, frontier city, Hamilton walk, mixed media hamilton events, shawn micallef, the trouble with brunch on April 25, 2017 by dave.